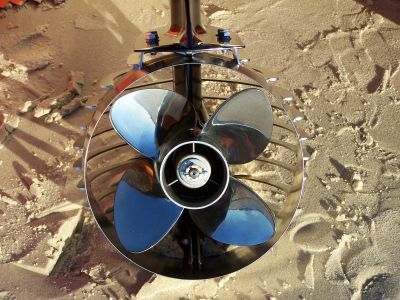 The 4 blade 9“pitch propeller was introduced to surf life saving Australia in 2003 by Midcoast Marine to assist with reducing speed and potentially injury. Since its approval, the 4 blade Powertech propeller has been a positive benefit to all surf life savers due to the increased white water grip and performance. Although speed has been reduced slightly, efficiency has increased. Less experienced IRB operators can drive with confidence with the level of grip and drive achieved by these outstanding propellers. The 4 blade Powertech propellers can be pitch corrected allowing your motor to operate at its optimum rpm range. 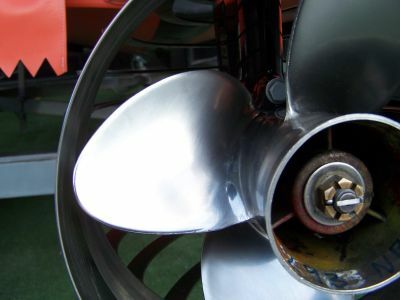 In IRB competition in Australia, 4 blade stainless steel propellers are the only style of propellers approved to be used.